Have you ever thought that most of our perception about the robot is based on the Hollywood movie! The famous 3CPO and R2D2 from Star Wars until the little cute garbage compacting robot named WALL-E; all of these machines are example of our dreams or should I say our quest to what we all think about the robot should be. Although the robot that we are going to build here is still far away from the technologies shown on those movies but at least it will give you an introductory to the robotics world. 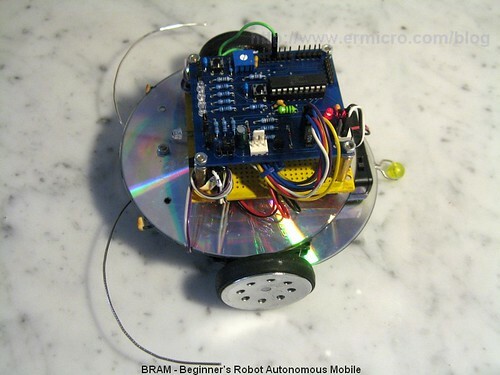 On this tutorial we will build BRAM which stand for Beginner’s Robot Autonomous Mobile, BRAM construction is designed to be easily built using some of the parts that you could easily found at home, this time we will use Microchip 8-Bits midrange PIC16F690 microcontroller as the BRAM’s brain. The first autonomous mobile robot is built by William Grey Walter around 1950 at the Burden Neurological Institute in Bristol as part of his research to model brain’s neuron. He built these three wheels robots named ELMER and ELSIE (Electro Mechanical Robot, Light Sensitive) which consists of just two electronic vacuum tubes that represent a simple 2 neurons, remember on those days transistors is just in their earlier stages; these two tube work as two stage amplifier to control a relays that connected to the two DC motors for the robot steering and locomotion. The steering motor also connected to the photoelectric cell tube sensor and only rotates in one direction. On the dark environment the steering and the driving motor will turn slowly; when the photoelectric cell capture a bright enough light, the steering motor will stop rotate (relay 1 on) and the robot move toward it (light attracted). When the light becomes too bright, the steering motor starts to rotate (relay 2 on) and the robot simply turn away from the light (light avoided). The touch sensor switch is connected to the clear plastic shell (that’s why it’s being called tortoise, because it looks like a tortoise shell) that covered the robot’s body. When the shell bumped to the object, the two stages amplifier will start to oscillate because of the feedback signal generated by the closed touch switch until the robot successfully avoid the obstacle. 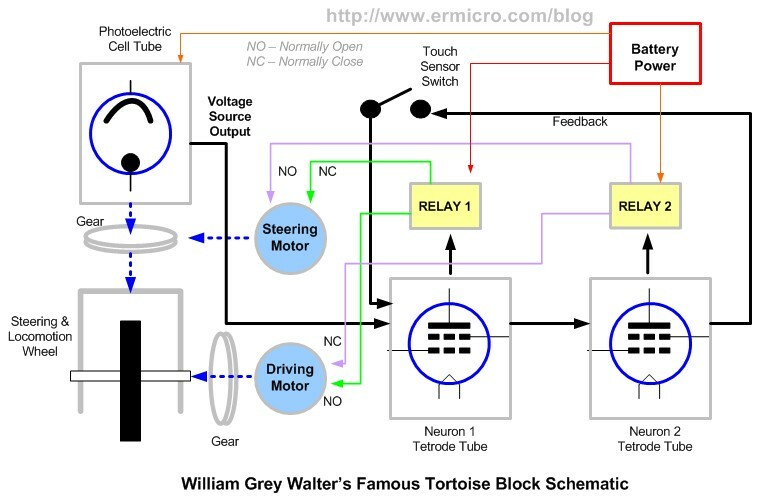 Using just a simple electronics neurons model, William Grey Walker is able to show a complex behavior caused by the combination of stimulus (sensors) and the interaction between these two electronics neuron. His works later on inspired many young generation roboticists such as Rodney A. Brooks (subsumption architecture) and Mark Tilden (BEAM) who pioneering a new approach to the robot’s artificial intelligent or known as the nature behavior based artificial intelligent. 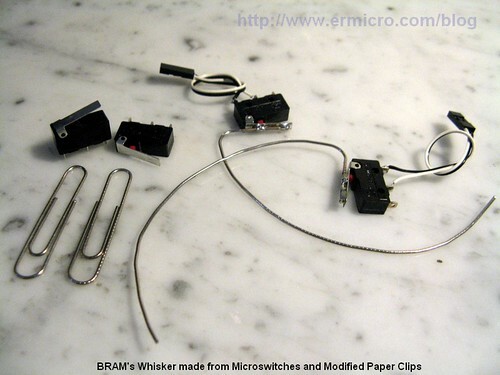 Two microswitches and two paper clips for the whisker or bumpers sensor (not shown on the above picture). Nuts, bolts, PCB (printed circuit board) holders, double tape to hold all of these parts together. From the above picture you could see that I use a solder’s thin to join the modified paper clip to a microswitch actuator arm; make sure you clean both surfaces with the sand paper first before start soldering them together. 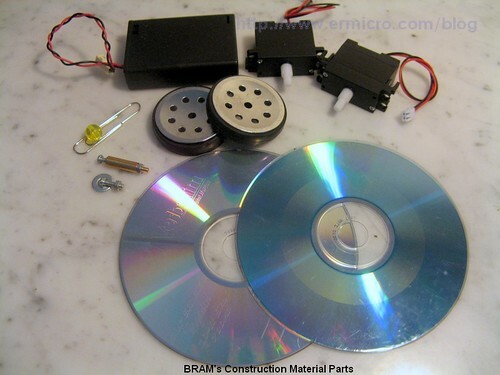 What good about the BRAM’s chassis material; its easy to drill (made from polycarbonate plastic) and I bet you have plenty of these unused CD/DVD’s at home or if not just buy a new blank CDs. 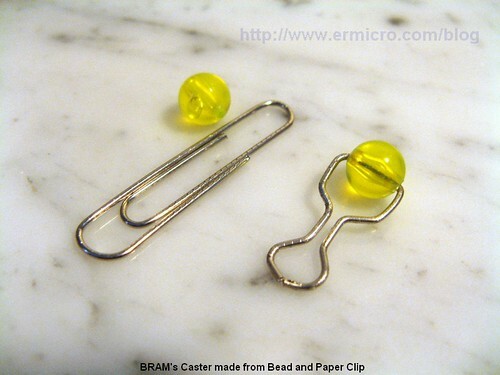 Bellow is the BRAM’s design drawing I used on this tutorial. 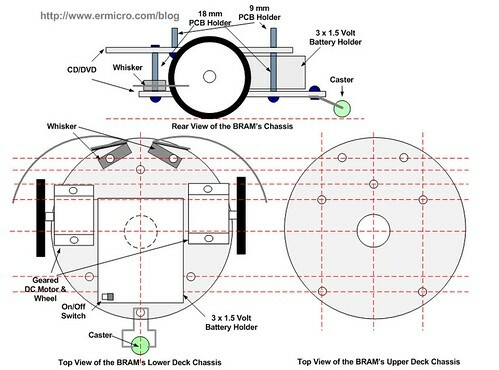 The next two pictures show you how to put all these parts together to the BRAM’s chassis. 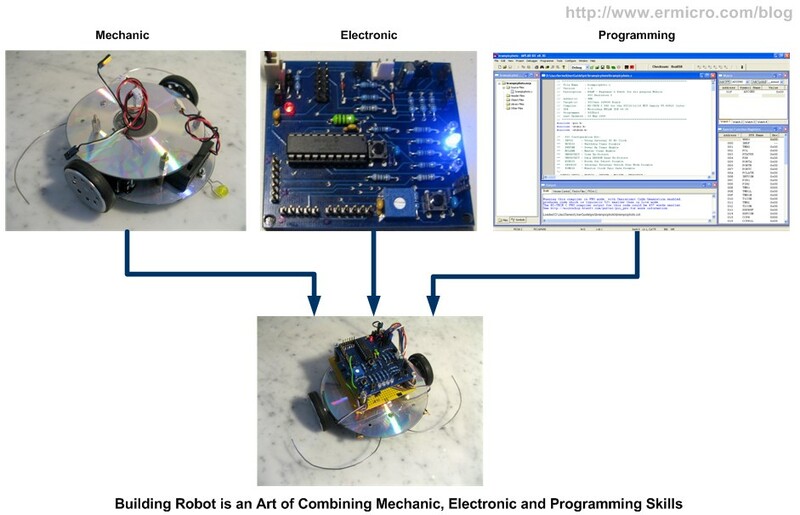 What make building the robot is an art; because building a robot is the combination of mechanic, electronic and programming skills, those skills must also be combined with the system control and artificial intelligence knowledge to make a robust and intelligent robot; therefore many years ago this kind of capabilities only reside inside the university labs or highly budget research company. Today’s with the introduction of cheap sophisticated microcontrollers and sensors the possibility of the amateur roboticists to build an entertaining or perhaps professional robots become widely open; especially with the introduction to the nature base artificial intelligent pioneered by Rodney A. Brooks and Mike Tilden which open a new approach to the mobile robot’s artificial intelligent, programming mobile robot become a reach of amateur roboticists. Their approach actually is base on the simple question, why such as simple animal likes ant or cockroach could survive in such a very complex nature environment and yet not required a very complex brain? The answer to this question is; because this little creatures use what its called nature behavior based intelligent; unlike the classic approach to artificial intelligent which required a powerful computing power, this new approach make it possible for us to implement it on the 8-bit class microcontroller such as Microchip PIC16F690 microcontroller. This behavior based artificial intelligent model is simply tell us that we develop the robot’s behavior start from the very primitive form such as obstacle avoidance and slowly added a new more complex behavior on top of it. 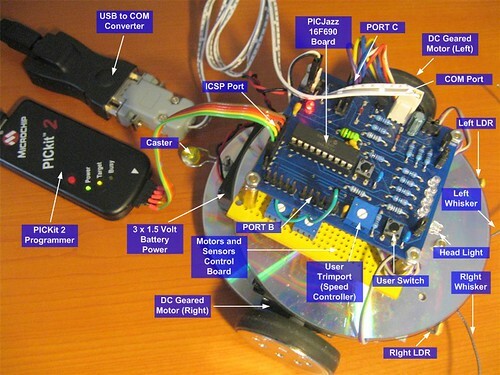 The DC geared motor is controlled by the two channels SGS-Thomson L293D motor driver chips, this chip is used to make circuit more simpler compared to the standard transistor’s base H-Bridge driver, the L293D chip is able to handle non repetitive current up to 1.2 A for each channels and its already equipped with the internal EMF (Electromotive Force) protection diodes. The L293D enable input (ENABLE1 and ENABLE2) for both channels is controlled by PWM (Pulse Width Modulation) supplied by the PIC16F690 microcontroller RC3 port which configured as single output PWM , pulse steering mode. For more information about the PIC PWM please refer to my previous posted blog H-Bridge Microchip PIC Microcontroller PWM Motor Controller. The PWM width is controlled by user trimport attached to RA0 port, this make BRAM’s speed could be adjusted (faster or slower) by adjusting this 10K trimport. The LDR (Light Dependent Resistor) is use as light sensor, together with the 10K trimport works as the voltage divider circuit to the RC0 and RC1 ADC (Analog to Digital Converter) ports; the voltage supplied to this input will vary according to the light intensity, for more information of how this circuit work please refer to my previous posted blog Basic Servo Motor Controlling with Microchip PIC Microcontroller. 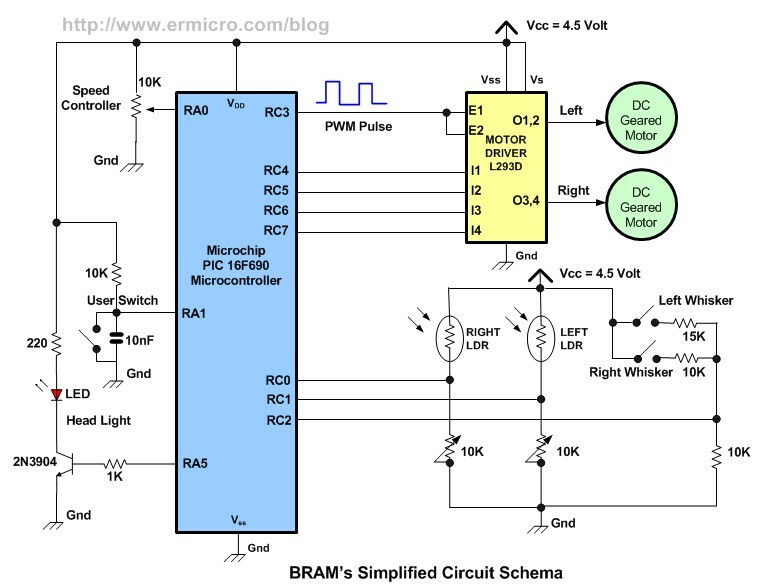 Using the well known R-2R ladder resistor circuit, BRAM’s use this simple 2-bits DAC (Digital to Analog Converter) circuit to read the two bumper switches (whiskers) through the PIC 16F690 microcontroller RC2 ADC port. For more information about the R-2R ladder circuit please refer to my previous posted blog Basic Resistor Circuit. There are two reasons why I am using the DAC circuit to read the switches. The first one, because I am using the output not just for reading the switch status but also use the value to generate random number for the avoidance behavior algorithm, the second one is; I could use just a single ADC microcontroller’s port to read many switches at the same time. HI-TECH C PRO for the PIC10/12/16 MCU family V9.60PL5 (Lite). As shown by William Grey Walter with his tortoise robot, BRAM’s also show some kind of intelligent which is quite entertaining especially for my kids as they start to build their own maze and see how BRAM could solve that maze. 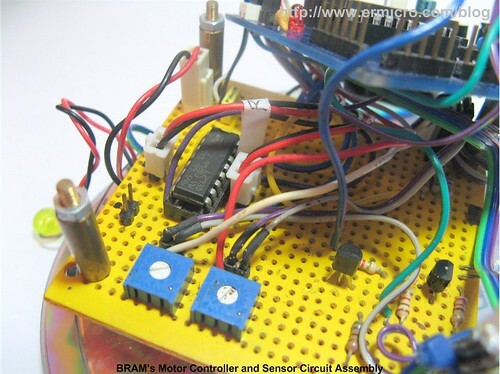 On the second part of this tutorial we will explore more detail of the BRAM’s brain and how we utilize Microchip PIC 16F690 microcontroller UART peripheral for debugging BRAM. can u please provide the PCB layout of the PICJAZZ board.and how can we modify the circuit to drive a 12V dc geared motor? Thanks, the L293D driver controller is designed to work up to max 36 volt, you could easily drive 12 volt geared motor by supplying the 12 volt to the Vs pin (Supply Voltage/Motor Supply pin) while keep the 4.5 volt on the Vss pin (Logic Supply Pin). For the PICJazz 16F690 PCB, currently we not publish it to the public; only the schematic which you could download from this blog. so i want the circuit diagram to make it, can u please help me. i want the diagram with the connecting port (to programme)can you……………………. will this programmer help me to program PIC 16f877A ic??? so my line following robot moves knw? About the Microchip PIC16F877A programmer, my recommendation is to use the Microchip PICKit 2 or PICKit 3 programmer. 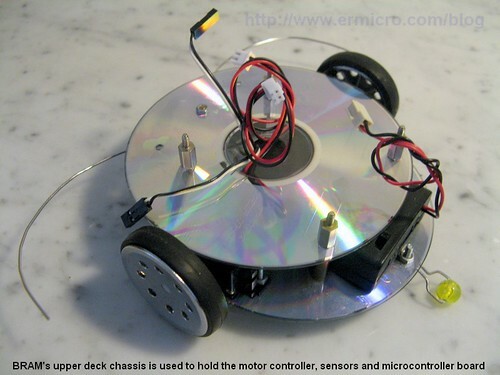 I was wondering if I Could ask you about the wheels and DC motor, what is the specific name of the DC motor and the wheels that were used in this project? 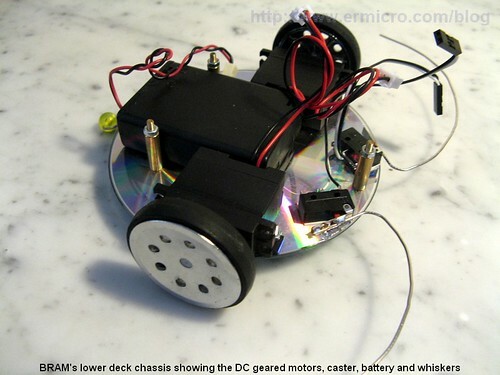 You could experiment with any DC geared motor or you could use the Solarbotic GM2 DC geared motor. One more question, you have used 8MHz crystal, am I right? I used the PIC16F690 Internal 8 MHz internal clock.